The first purpose-built prison to house both men and women opened its doors for inspection on Wednesday and visitors were told women would do the cooking. Councillors and the media saw the new £65m Peterborough jail which will house 480 men and 360 women. Built on a former factory site the new prison is run by a group of private firms including Interserve Projects and Royal Bank of Scotland. It is expected to take its first prisoners later this month. The majority of its 400 employees will be prison officers but staff will also be employed in medical, teaching and administrative roles. The prison is on the old Baker Perkins site in Westwood in the city and will be run under a 25-year Private Finance Initiative contract. The prison was built despite a great deal of protest from local residents. Women inmates will do all the cooking at Britain's first purpose-built mixed prison, the visitors were told. "There is a chance in the future of much larger prisons where we hold men, women, young offenders and prisoners of different security categories so that we get people altogether in the same place. Prison chiefs fear male inmates would "adulterate" food intended for female prisoners if they were let loose in the kitchen at Peterborough jail. Prison director Mike Conway said: "Whenever we have prisoners operating in kitchens and there is a risk of adulterating food, we carry out a risk assessment. "It was far more likely that males would adulterate food going to the female side than vice versa. "It also provides a good opportunity for female prisoners to get NVQs in catering." Mr Conway did not elaborate on what substances male inmates would use to adulterate the women's food. 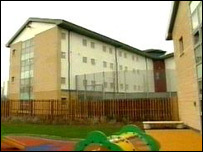 Top prisons' boss, Martin Narey, said he believed the design would become a blueprint for the prisons of the future. Chief executive of the National Offender Management Service, Martin Narey, said: "There is a chance in the future of much larger prisons where we hold men, women, young offenders and prisoners of different security categories so that we get people altogether in the same place. "We can really learn a lot from this."